I think of simplicity as very spiritual and for me the color that came instantly to mind was white. To simplify your life is very ZEN and reminiscent of monks or nuns that give up all the trappings of the world to seek a higher power. So I knew I wanted to create something that was very simple in color with a subject that has a peace about it. I also wanted to include circles, round edges have more simplicity than hard straight lines. When I went to pick an image, I realized that I have a sketch on the work table that would be perfect. Originally, the plans for it were very colorful, layered and complex. So I decided to deconstruct the drawing to some main lines and do a simple single colored stitch. Although, I am not a big ‘pink person’, I am actually very thrilled with how this came out and might do a few more like this. When you look at this piece, what do you see? I would like to know if the image is obvious to the new viewer, or if it is too abstracted or too subtle. Click here if you want to see the photo inspiration. About 81/2″ by 12″ totaly including ribbon. Created by simple zigzag stitch on fabric with satin trim. For Jen’s Challenge Week 7 Simplicity As usual, a great challenge that I am glad to have accepted! 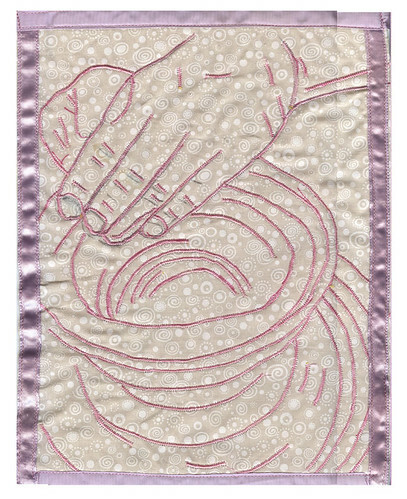 This entry was posted in Fiber Goodness, Jen's Challenge 2008, Passions and tagged art, collage, Fiber Goodness, hands, pink, sewing on February 16, 2008 by Sheba.